A FAQ/sticky on various clutch disks and pressure plates used with the various transmission swaps. Early 8.5" flywheel diaphragm pressure plate options. Ford 8.5" flywheel, step depth = 1.0"
Below are two options that are currently in use, after appropriate flywheel rim skimming (.12" - .13"). 1968 - 1994 Alfa Romeo 215mm flywheel, step depth = .878"
1968 - 1986 Mercedes w/215mm flywheel, step depth = .885"
All w/ 215mm flywheel. 84-86 190 is easiest to find. Anybody have info on 215mm VW pressure plates or flywheel step depth? I had issues with the last two three finger rebuilds I bought. They were junk. Not from poor workmanship on the rebuilding so much as the fact that had clearly been rebuilt at least three or four times. They were just sloppy and worn out. Garbage in, garbage out. Goodbye 45 year old FoMoCo, hello brand new Sachs plate. Darwin wrote: I was and still am looking at the MB or Alfa diaphragm plate as an option, but the cheapest I could find that looked like an original plate for the MB was $103.00....So, I think for at least the initial phase of getting this thing up and running I am going with the stock pp and of course a new clutch disc.....I have a '68 200 block with the 2.77/8.5" recessed flywheel....I have found a number of options.....which is the right one or the best one here I am not entirely certain. Napa NCLRF1034----OEM specs....8-1/2 10 spline 1-1/2" shaft---Organic. Oreillys Centerforce CTR281220 "" "" "" " New Compos.? Autozone FCP1177D OEM type....."" "" "" " Organic. The second is ?? looks like over $100.00. The last one is $33.00 with a $6.00 core. Of course price is important but from what I have heard the stock pp has it's drawbacks and I want the best clutch/pp combo to try and make up for some of the pp issues that some have talked about.... BTW the middle one is not a full circle/round disc---It is one of those that has square pads all the way around it. Guys......if you have the small bell (4bolt) like my 66, then I recommend a Dial-a-Clutch system....its Exedy made with 21 finger PP and comes as a kit delivered for $152.00 No rebuilt 3 finger or other stuff. The things look like heck when the come back and go out the same way. I wouldn't trust them no how no way. I have a question about Throw out bearings for these 215MM. Pressure plates. what kind of throw out bearing do you use with the alfa PP. Flat or rounded? Are the fingers different on the Alfa plate compared to the mercedes? I was told that I need a rounded throw out bearing instead of a flat one that I bought for the mercedes PP. The guy at the shop said I could probably get away with using the flat bearing but it might wear a groove in the PP fingers. he was unable to find a rounded bearing for the application or did not know what to cross reference it to. I guess if i can find a rounded bearing I'll go with that. still looking though. I'm about ready to bolt up my 190e sachs mercedes PP setup. I got all the machining done on the 8.5'' dished flywheel. I had .12 taken off of the top rim as well as a small notch on the inside of the clutch disc surface of the fly wheel to relieve for the wider clutch disc springs. I also got them to step up the bolt size to 3/8''. Instead of drilling out the old bolt hole they just taped out one of the blanks to the right of the original holes which where already drilled the correct 5/16'' for the new 3/8'' tap. The clutch shop also bolted the setup together and tested it to make sure it worked and they said the clutch released very nicely. I was also lucky enough to find a nos ring gear for the old flywheel since my old one was pretty bad. Thanks guys for all the help and thanks to Ricks website which gave me alot of heads up on stuff. I have heard any pp and disc from a 4 cyl. 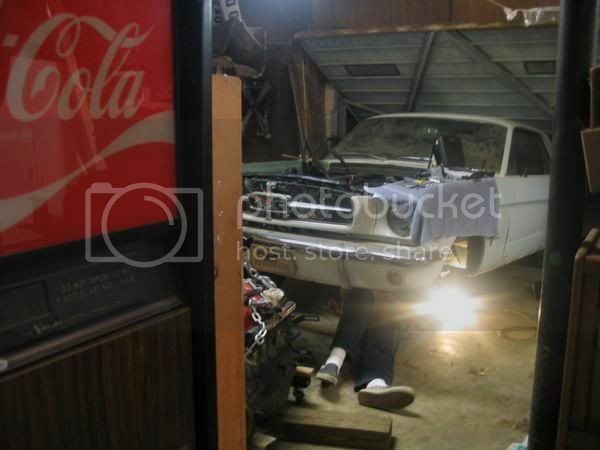 Mustang 1987-1993 will work. Someone correct if I am wrong. (previously 3.03 3 spds) and now a 3+1 o.d.trans I can't find a shifter for. takes a different starter 130+ teeth on flywheel. use most ford 3 spd, most ford 4 spd and this weird ford O.D. that I can't find a shifter for. As I am doing my T-5 conversion I found out that a 93 Ranger has the correct sized clutch and pressure plate. I'll send photos. Is that for the 2.3 engine in the ranger? Yes it is for a 93 Ranger 2.3L engine. TxAgs66 wrote: As I am doing my T-5 conversion I found out that a 93 Ranger has the correct sized clutch and pressure plate. I'll send photos. 60tudor wrote: Is that for the 2.3 engine in the ranger? TxAgs66 wrote: Yes it is for a 93 Ranger 2.3L engine. The 2.3l Ranger uses a 8-7/8" clutch disc and pressure plate on flat flywheel. The pre-66, small pattern blocks use an 8-1/2" (215mm) clutch disc & flywheel with a 1" step. Ranger stuff won't fit inside the small bell. This thread is about the early "small bell" clutch disc/PP/flywheel/TO bearing assembly options, and modern interchanges for the old, now unobtainium (in good condition) three finger PPs. Maybe somebody could start a sticky about the dual pattern blocks (66 - 80 9"), and modern clutch disc/PP/ flywheel assembly interchanges? Brand new clutches available here for the 8.5 clutch set up. Talked to them today and they have the Kit in stock for around $230, dont know if thats Canadian dollars or US. So i didn't notice this question being addressed but the mustang 2.3 seems to have a 216mm PP. Now will the clutch itself work without modification? I just got done installing a new clutch and pressure plate in my 62 Falcon. I used a new Sachs 1986 Mercedes Benz pressure plate and a Centerforce disc for a Mustang II. I have a 200ci engine with a 4 speed from a V8 Torino. Previously I had a remanufactured three finger PP with a new disc, but I never had strong holding power from the beginning, and it just got worse as time went by. I love the new setup and don't know how I went without it for so long. Installation was no harder than it would have been replacing a stock clutch (other than having the flywheel machined). This upgrade was definately worth it. Thanks for posting the information on here. It works great. The Squire wagon is still my daily driver. Say about 65,000 miles since the Alfa plate swap, with zero problems. That's a lot of miles, I should start thinking about a new clutch! More involved than initially thought. I just recieved the 215 conversion back from by machinest. Total cost of the work was $320. More work than just removing material and bolting it on. My builder races a FAlcon and was excited about doing this midification since finding an adequete 8.5 3 finger clutch that would be effective behind a built 200 wasn't going to happen and the diaphram set up was the way to go. I'll keep you all posted on the results. 69.5Mav wrote: Brand new clutches available here for the 8.5 clutch set up. Will this kit fit a 61' falcon with a 170" and the 3 speed? 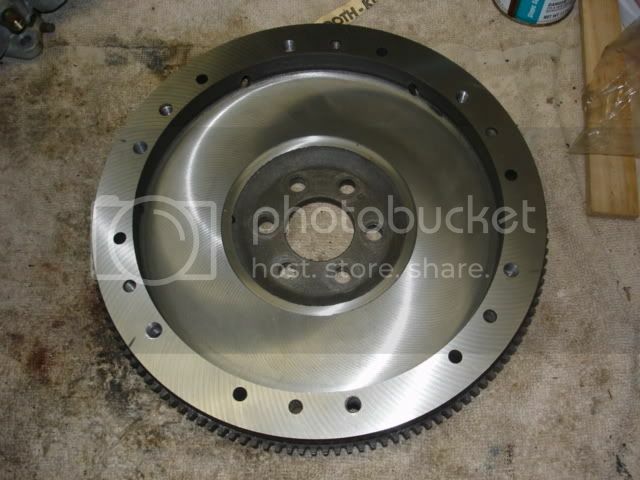 Your 61 Falcon, if stock, should have the 8.5 flywheel; this should work. Alpha Swap came out great.. I just finished installing a 93 S10 T5 in the Falcon. I love it!!!!!! I used a Dag bell with the 8.5" recessed flywheel. I made my own adapter. 86 Mercedes PP, I machined a small bevel to make sure it didn't rub inside the bell. 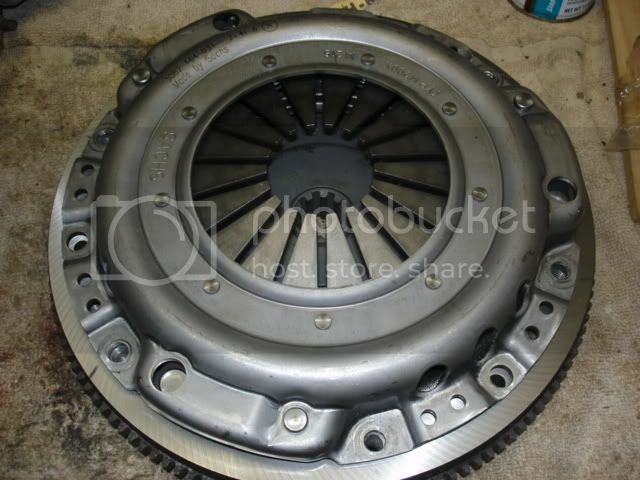 Jeep clutch, which according to Oreilly's is the same for 87 to 94 sunbird 4cyl. 74 Vega TO bearing machined down for the plate with clips from an early Ford that matched the fork. 202 bearing for the pilot bearing, matched the crankshaft and input shaft. Tapped the PP bolt holes to 3/8". Had a new driveshaft with 1310 ends. Chevy yoke and a simple joint in the rear. Same starter as the auto. This is an electric speedometer only setup!!!!!!!!!!!!!!!!!!!!!!!!!!!!!!!!!!!!!!!!!!!!!!!!!!!!!!!!!!!!!!!!!!!!! I think I will lower the front of the engine some to level it out. Also the Chevy T5 has a boss sticking down. As low as the Falcon sits, it will have to go! The S10 V6 T5 combined with my tall tires and a 3:20 gear seem to work well together. 1st to 2nd shift is at 10 mph cruising or 20 mph @ 3000 rpm. 2300 rpm at 70 mph in 5th. Thanks Rick and all who have contributed to this info. Now, if you'll excuse me, I think I'll go shift some gears. I am about to perform the T5 upgrade on my 65 mustang 200... Instead of the Alfa Sach PP could we not use the 90's mustang 2.3 clutch kit which is also 8.5" ? It looks like it would be cheaper than the Alfa since the mustang clutch kit also includes the clutch disc. There is a Sach clutch kit which I would assume is the same quality as the Alfa kit. That being said of the ones listed on the above link which is the quality? It's not for a recessed flywheel. The 2.3's had a flat flywheel. Stubby wrote: Also the Chevy T5 has a boss sticking down. As low as the Falcon sits, it will have to go! I cut that bottom "fin" off, too. Sawzall saws all. Does the diaphragm pressure plate require less pedal pressure then the old three finger pp? Yes, you will love the diaphram PP. jlopes wrote: I am about to perform the T5 upgrade on my 65 mustang 200... Instead of the Alfa Sach PP could we not use the 90's mustang 2.3 clutch kit which is also 8.5" ? I tried the mustang 4cyl clutch and its a no go. It would need alot of machine work to fit the clutch disc. The overall diameter is perfect just the center doesn't fit. By the time you spend all the money on machine work its cheaper to buy the clutch kit from Modern Driveline. When I took my flywheel to a local machine shop, along with resurfacing, taping 6 holes and taking some of the top surface off they were also recommending balancing the flywheel. Reading thru all the previous posts I only noticed one person mention balancing their flywheel. Is this a necessary procedure? Any and all imput on this subject would be appreciated. Wouldn't hurt to have it balanced. Make sure you balance the flywheel with the pressure plate as a unit. Would it be possible to stand the PP off of the flywheel with 1/8" thick washers, instead of milling? Falcon-O-Tron wrote: Would it be possible to stand the PP off of the flywheel with 1/8" thick washers, instead of milling? You're going the wrong way. The step on the flywheel has to be less than it was originally. The original step is around 1-inch. The milled step is 0.875, 0.125 or 1/8" less. By installing washers, you are effectively making the step taller, not shorter. So the milling would need to be done on the flywheel where the PP mounts? Would the milling be necessary since its only an 1/8" gap? The clutch disc would still grab the flywheel right? If you don't mill the step, the pressure plate won't clamp down on the clutch disc enough; the clutch will chatter when releasing the pedal. Eventually the clutch will slip and fail prematurely. The original height of the step on the Ford 8.5-inch flywheel is 1-inch. When resurfacing the flywheel, the step has to be milled the same amount that was taken off the flywheel surface. If you don't, the clutch will chatter. Ask me how I know. On the Alfa Romeo flywheel, the step is only 0.875" (approximately). So in order to use the Alfa pressure plate on the Ford 8.5-inch, the step has to be at least the same height. Mill the step to much, and the clutch won't release. I called Performance Clutch and they have them (stock PP) but only in a kit. Unfortunately, I need the 1-11/16" 10 spline for my 3.03 conversion. They did hook me up with a number to D & W clutch which has a PP for the 8-1/2" dished FW for $60 but the guy believes it's the 3-finger and I'd imagine it's a reman also. I'm supposed to call back tomorrow. Last edited by Falcon-O-Tron on Sun Jan 15, 2012 8:37 am, edited 1 time in total. About 74,000 miles on my Alfa PP conversion, so far. ZERO problems. Many have done this since (early 2004), most (all?) are very happy with the results. Guys - So the MB PP just bolts on after milling the outer surface of the FW? I'm still considering this method eventhough I have a new (Chinese ) 3-finger PP on it's way. Any other things that need to be done to make the MB PP work? Falcon-O-Tron wrote: Guys - So the MB PP just bolts on after milling the outer surface of the FW? I'm still considering this method eventhough I have a new (Chinese ) 3-finger PP on it's way. Any other things that need to be done to make the MB PP work? There's not that much difference between the MB and AR pressure plate. You just have to make sure the step on the 8.5-inch flywheel is milled enough to allow the PP to fully clamp the clutch disc. Link to the 8 year/100k+ update. Worked great all those years. One of the best of the many upgrades I've done to the Squire. Pics of 100k+ miles of wear from square face TO on round edge PP springs included. Not pretty, but that's the way I went with the replacement, too. 100k miles down the road before replacement is far enough out for me, for a clutch. I am working on the same sort of modification in my '65 Falcon sedan, with an early 7-main 200 and a stepped flywheel. I have run into a snag however. I am switching transmissions from the small 2.77 3-speed to a larger T86 3-speed with an R10 overdrive. The T86 has the larger 10-spline center (same as a T10) and as far as I can find......there is no 8" inch Clutch disc with a large 10-spline center. What can I do for a Clutch disc?